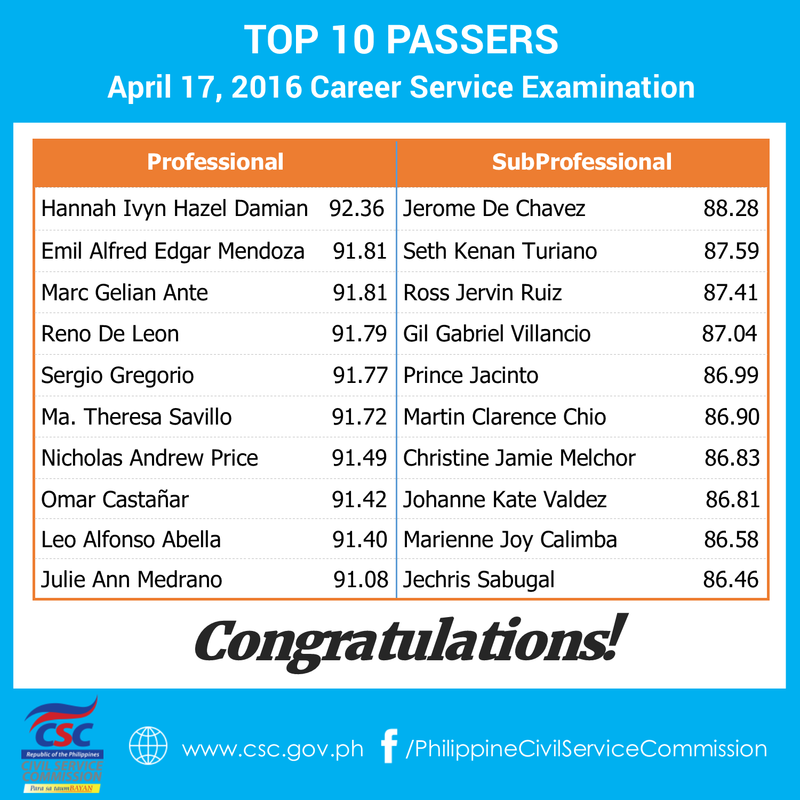 The Civil Service Commission (CSC) officially announced the top 10 passers (topnotchers) for the Career Service Exam - Paper and Pencil Test (CSE-PPT) conducted nationwide last April 17, 2016. According to CSC, a total of 25,276 out of 229,463 examinees or 11.02% passed the examinations. With a rating of 92.36, Hannah Ivyn Hazel Damian from the National Capital Region (NCR) bested the 187,720 examinees of the Professional level. Emil Alfred Edgar Mendoza, also from NCR, and Marc Gelian Ante from Bicol region shared the second spot, both with a 91.81 rating. Other top performers of the Professional level all came from NCR: Reno De Leon-91.79; Sergio Gregorio-91.77; Ma. Theresa Savillo-91.72; Nicholas Andrew Price-91.49; Omar Castañar-91.42; Leo Alfonso Abella-91.40; and Julie Ann Medrano-91.08. On the other hand, topping the 29,797 SubProfessional examinees was Jerome De Chavez from NCR with a rating of 88.28. Seth Kenan Turiano from Bicol region followed with an 87.59 rating. Ross Jervin Lorenz Ruiz, Gil Gabriel Villancio and Prince Jacinto, all from Southern Tagalog, followed with ratings of 87.41, 87.04 and 86.99, respectively. Other top scorers were: Martin Clarence Chio (NCR)-86.90; Christine Jamie Melchor (Ilocos region)-86.83; Johanne Kate Valdez (CAR)-86.81; Marienne Joy Galimba (CAR)-86.58; Jechris Sabugal (Cagayan Valley)-86.46. The CSC further reported that NCR posted the highest passing rate (18.36%) for the examinations. The percentage figure covers 6,265 passers out of 34,132 actual examinees. Of the 6,265 passers, 5,465 passed the Professional test while 800 passed the SubProfessional test. Cordillera Administrative Region (CAR) landed the second spot with 15.86% or 1,283 passers out of 8,092 examinees. Apart from civil service eligibility and education, CSC clarified that the new eligibles must also meet the other basic requirements of experience and training for permanent appointment to a government career service position. Moreover, applicants to government posts may undergo an internal screening process by the agency’s Personnel Selection Board, which may be composed of written tests, interviews, and other processes to determine the most qualified candidate for a vacant position. The CSC said examinees may get their individual test results using the Online Civil Service Examination Result Generation System (OCSERGS), which can also be accessed on the CSC website, on or before June 12, 2016. Examinees, both passed and failed, are advised to access CSC Examination Advisory No. 08, s. 2016 now posted in the CSC website. While the civil service eligibility I.D. card is not yet available, passers may get their Certification of Eligibility from CSC Regional Offices (CSCRO) on or before June 29, 2016. CSC advises passers to coordinate first with the CSCRO on the availability, requirements and procedure in claiming their Certification. A complete directory of CSC Regional Offices is available at the CSC website. The next schedule of the Career Service written examinations is October 23, 2016. Filing of application is ongoing until Sep. 1, 2016. Applicants should personally file their applications at the CSCRO, or at any of the concerned CSCRO’s Field Offices, where they intend to take the examination.